Dr. Dhobb is a board certified General and Vascular Surgeon with a specific interest in the varicose vein treatment, spider veins, venous ulcers and thread vein removal. He has been committed to the treatment of venous insufficiency for over 20 years with extensive experience, offering the most contemporary minimally-invasive techniques to his patients. Dr. Dhobb received his medical degree from the Faculty of Medicine of Montpellier, France. Dr. Dhobb further trained in general and vascular disease at Montpellier and Paris University Hospitals. He is a board certified Surgeon (Paris, France) and a fellow of the French College of Vascular Surgeons. He is fully registred with the Spanish Authorities. He is one of a few vascular surgeons who received a full qualification in Angiology (Vascular explorations and vascular treatments) in Paris (France) and also completed a University diploma in Endovascular surgery. 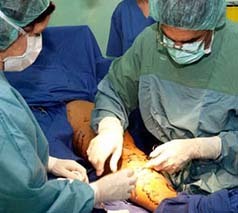 Dr. Dhobb is a consultant vascular surgeon who has had in-depth training and experience with all aspects of endo vascular surgery and open operative techniques to treat vascular disease. He has been pioneering research in minimally invasive treatments in vascular disease and has acquired extensive experience in treating successfully thousands of patients over the last 20 years. Dr. Dhobb is among the first vein doctors to start offering Endovenous Laser vein removal of varicose vein treatment in Spain. On top of Vascular surgery Dr. Dhobb completed a University Master in Aesthetic Medicine to widen his expertise in order to be able to offer his patients a complete range of well being and beauty enhancement in a safe environment using the best products and the last technology. Dr. Dhobb is the past Vice President of the International Union of Angiology. He is an international lecturer and has published many articles on the varicose vein treatment and other thread vein removal. Dr. Dhobb is one of Mills & Mills Medical Group’s leading surgeons in Spain.